For the last post of this blogging year, we have the last post in the series covering the summary statements of the third quarter of 1863. This is simply an administrative summary of the heavy artillery units in Federal service at the end of that quarter. Some of these did appear in the summary statements, usually offering little more than a location. In this installment, we’ll expand upon that a bit with the aim (which will fall short, no doubt) to have at least mention of all Federal units designated as artillery which were serving at that time of the war. The reality of the heavy artillery service is those units were by intent garrison troops. So in effect part artillery, but also part infantry. Both being on the “heavy” side of things. Not a lot of marching. Not a lot of combat. But a lot of drill and other propriety. And if artillery was crewed by the unit, those were typically considered property of the installation (be that a fort or other post) and not owned by the unit – for accounting purposes that is. Over my years of research, I’ve only seen a handful of these installation ordnance returns. The form was different, usually completed by an actual ordnance officer. I would presume from there the summaries were kept on a separate ledger. And I’ve never seen that ledger… if such exists. All that means is we are left simply accounting for units, assignments, and duty locations. And even then we must acknowledge the list will be incomplete. Some infantry units served, for all practical purposes, as heavy artillery. And, particularly in the New England states, un-mustered militia units often pulled duty in the seacoast fortifications. So there are a lot of hairs to split in order to claim a full, complete accounting. For now, let us just focus on units mustered as, and thus designated as, heavy artillery. And we’ll look at those by state. 1st Connecticut Heavy Artillery: As mentioned earlier, Batteries B and M served with the Army of the Potomac, in 2nd Volunteer Brigade, Artillery Reserve. The remainder of Colonel Henry L. Abbot’s regiment transferred to Second Brigade of the Defenses South of the Potomac (DeRussy’s Division, Twenty-Second Corps), defending Washington, D.C. Regimental headquarters were at Fort Richardson. Abbot pulled double duty as the brigade commander. 2nd Connecticut Heavy Artillery: Also serving in Second Brigade of the Defenses South of the Potomac. This regiment was under Lieutenant-Colonel Elisha S. Kellogg. Ahl’s Heavy Artillery Company: Discussed under the state entry. Battery G, 1st Illinois Artillery: Serving at Corinth as siege artillery. Battery K, 2nd Illinois Artillery: In the Natchez garrison. 1st Indiana Heavy Artillery: We took the opportunity to discuss this regiment in detail in an earlier post. 12th Indiana Battery: Serving at garrisons in Tennessee. 13th Indiana Battery: In garrison at Gallatin, Tennessee. 16th Indiana Battery: Part of the Harpers Ferry garrison. 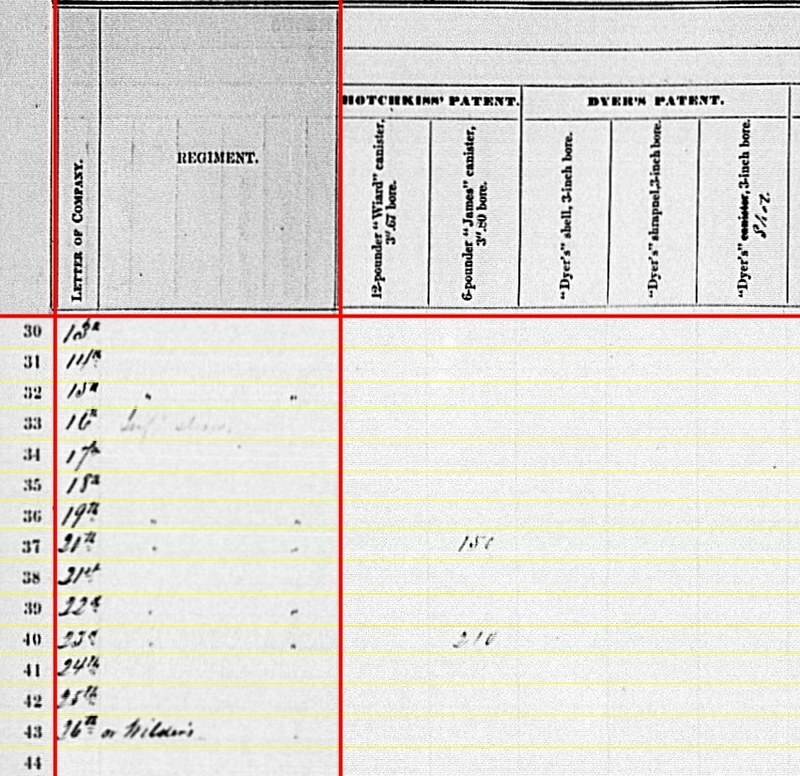 1st Louisiana Heavy Artillery (African Descent): A placeholder entry in the summaries. See post for details. 1st Maine Heavy Artillery: Under Colonel Daniel Chaplin, was part of the defenses of Washington, D.C., assigned to the north side of the Potomac. The regiment had detachments in Maine on recruiting duties and at the seacoast fortifications (mostly recruits being trained up for duty). Company A, 1st Maryland Heavy Artillery: Details of this unit are scarce. Not exactly sure when it began to organize. By mid-1864, the entire regiment numbered only fifty men. As it failed to fully organize, those present were assigned to duties around Baltimore. 1st Massachusetts Heavy Artillery Regiment: Assigned to First Brigade of the Defenses South of the Potomac – DeRussy’s Division, Twenty-Second Corps. Colonel Thomas R. Tannatt commanded the regiment, and also commanded, temporarily, the brigade. 2nd Massachusetts Heavy Artillery Regiment: Freshly formed under Colonel Jones Frankle, this regiment left Massachusetts during the first weeks of September. Headquarters were going to New Berne, North Carolina. But the companies would serve at different stations throughout North Carolina and tidewater Virginia. 1st Battalion, Massachusetts Heavy Artillery: This battalion was formed with four previously independent batteries and served primarily at Fort Warren, Boston harbor. The four companies were originally the 1st, 2nd, 4th, and 5th unassigned heavy companies (becoming Companies A, B, C, and D respectively). Major Stephen Cabot commanded this consolidated battalion. 3rd Company, Massachusetts Heavy Artillery: At Fort Independence, Boston, under Captain Lyman B. Whiton. Mustered into Federal service in January 1864 (as part of 3rd Massachusetts Heavy Artillery). 6th Company, Massachusetts Heavy Artillery: Under Captain John A.P. Allen at Fort at Clark’s Point, New Bedford, Massachusetts. Would not actually muster into Federal service until May 1864 (as part of 3rd Massachusetts Heavy Artillery) . 7th Company, Massachusetts Heavy Artillery: Unattached, but serving alongside the 1st Battalion at Fort Warren. Captain George S. Worchester commanded. Mustered into Federal service in August 1864 (as part of 3rd Massachusetts Heavy Artillery). 8th Company, Massachusetts Heavy Artillery: Captain Loring S. Richardson commanded. Boston garrison. Mustered into Federal service in August 1864 (as part of 3rd Massachusetts Heavy Artillery). 9th Company, Massachusetts Heavy Artillery: Captain Leonard Gordon commanded. Boston garrison. Mustered into Federal service in August 1864 (as part of 3rd Massachusetts Heavy Artillery). 10th Company, Massachusetts Heavy Artillery: Commanded by Captain Cephas C. Bumpas. Boston garrison. Mustered into Federal service in September 1864 (as part of 3rd Massachusetts Heavy Artillery). 11th and 12th Companies, Massachusetts Heavy Artillery: These companies were still organizing at the close of September 1863. They were, like the others, earmarked for garrison duty around Boston. Not mustered into Federal service until October-November 1864 (as part of 3rd Massachusetts Heavy Artillery). 2nd Missouri Artillery: As detailed in the summary post, this regiment was reorganizing and transforming from garrison artillery to light artillery. 1st Mississippi Heavy Artillery (African Descent): Formed at Vicksburg in September. Colonel Herman Lieb commanded. Later became the 5th US Colored Heavy Artillery. 2nd Mississippi Heavy Artillery (African Descent): Formed at Natchez in September, we looked at this regiment as a possible explanation for an entry line with the Mississippi Marine Brigade. Colonel Bernard G. Farrar commanded. Later became the 6th US Colored Heavy Artillery (a duplicate of the 1st Alabama Siege Artillery, above). 1st Company New Hampshire Heavy Artillery: Under Captain Charles H. Long, this battery formed in the spring of 1863 and was mustered into service at the end of July. The company garrisoned Fort Constitution. In 1864, this company, along with the 2nd, below, became the nucleus for the new 1st New Hampshire Heavy Artillery Regiment. 2nd Company New Hampshire Heavy Artillery: Organized in August and mustered in September, this company garrisoned Fort McClary, Kittery Point, New Hampshire. Captain Ira M. Barton commanded. 2nd New York Heavy Artillery: We discussed Colonel Joseph N. G. Whistler’s regiment while covering a lone entry for Battery L (which later became the 34th New York Independent Battery). The 2nd New York Heavy was assigned to First Brigade, DeRussy’s Division, South of the Potomac. While Whistler commanded the brigade, Major William A. McKay led the regiment. 4th New York Heavy Artillery: Assigned to the Fourth Brigade, DeRussy’s Division, Defenses South of the Potomac. Detachments manned Fort Marcy and Fort Ethan Allen. When Colonel Henry H. Hall was promoted to Brigadier-General, Captain John C. Tidball, of the regular army, was commissioned at the regimental commander in August. 5th New York Heavy Artillery: This regiment served by battalions at different postings. Colonel Samuel Graham, of the regiment, commanded the Second Brigade of Baltimore’s defenses. Lieutenant-Colonel Edward Murray was in charge of two battalions of the regiment in that brigade. Third Battalion, under Major Gustavus F. Merriam, was in the defenses of Washington in First Brigade, DeRussy’s Division, South of the Potomac. 6th New York Heavy Artillery: Colonel J. Howard Kitching commanded. The regiment was part of the Harpers Ferry garrison before the Gettysburg Campaign, and soon brought into the Army of the Potomac. At the time of the Bristoe Campaign, the regiment was serving as ammunition guards and handlers for the Army of the Potomac. 7th New York Heavy Artillery: Second Brigade, Defenses North of the Potomac, Twenty-Second Corps under Colonel Lewis O. Morris (who also commanded the brigade). 8th New York Heavy Artillery: Under Colonel Peter A. Porter, this regiment had garrison duty at Forts Federal Hill, Marshall, and McHenry around Baltimore, as part of Eighth Corps, Middle Department. On July 10, the regiment moved forward to Harpers Ferry. On August 3, the regiment returned to Baltimore. 9th New York Heavy Artillery: Second Brigade, Defenses North of the Potomac, Twenty-Second Corps under Colonel Joseph Welling. 10th New York Heavy Artillery: This regiment formed the Third Brigade, Defenses North of the Potomac, Twenty-Second Corps. Commanded by Colonel Alexander Piper. 11th New York Heavy Artillery: We discussed their saga in an earlier post. Colonel William B. Barnes’ regiment was still forming and incomplete when thrust into the Gettysburg Campaign. The total number of men mustered was about a battalion strength. Returning to New York in mid-July, the regiment helped suppress the draft riots. Afterward, the companies of the regiment served the forts around the harbor. However, with the end of July and regiment not forming out to full strength, the men were transferred at replacements to the 4th New York Heavy and the regiment disbanded. 12th New York Heavy Artillery: Colonel Robert P. Gibson began recruiting this regiment in March, 1863. Never fully recruited, the state revoked the authorization and the men were transferred to the 15th New York Heavy. 13th New York Heavy Artillery: Recruited by Colonel William A. Howard starting in May 1863, this regiment mustered by company and served by company and battalion detachments. First Battalion, with Companies A, B, C, and D, under Major Oliver Wetmore, Jr., departed for Norfolk in October. 14th New York Heavy Artillery: Colonel Elisha G. Marshall recruited and organized this regiment starting in May 1863. Mustering by company, only six were in service by mid-October. Those mustered were initially assigned to the defenses of New York City. 15th New York Heavy Artillery: Also authorized in May 1863, Colonel Louis Schirmer commanded this regiment. The nucleus of this regiment was the 3rd Battalion New York (German) Heavy Artillery, which had served from the fall of 1861, mostly in the Washington defenses. On September 30, that battalion (five companies) was consolidated with new recruits originally from the 12th Heavy to form the 15th Heavy. They were assigned to Fourth Brigade, DeRussy’s Division, South of the Potomac (with Schirmer commanding the brigade). 16th New York Heavy Artillery: Colonel Joseph J. Morrison began organizing this regiment in June 1863. Receiving men from the 35th Independent Battery and other organizations, the 16th Heavy began mustering in September. Companies A, B, and C left the state for Fort Monroe in October. 9th Independent Battery: Assigned to Fort Reno, in the defenses of Washington. 20th Independent Battery: Part of the garrison of Fort Schuyler, New York. 28th Independent Battery: Also assigned to Fort Schuyler. 1st Ohio Heavy Artillery: Originally the 117th Ohio Infantry, this regiment changed to heavy artillery in May 18663. Colonel Chauncey G. Hawley, who was promoted in August, commanded this regiment. They garrisoned Covington, Paris, and other posts in Kentucky as part of Twenty-third Corps, Department of Ohio. In October, the regiment moved to cover posts in Tennessee. 2nd Ohio Heavy Artillery: Under Colonel Horatio G. Gibson, this regiment began mustering, by company, in July 1863. By the end of September, all twelve were in service. The companies initially served at Covington Barracks, but were soon detailed to other posts in Kentucky. 2nd Pennsylvania Heavy Artillery: (the 112th Regiment Pennsylvania Volunteers.) Under Colonel Augustus A. Gibson and assigned to First Brigade, Defenses North of the Potomac. Regimental headquarters at Fort Lincoln. 3rd Pennsylvania Heavy Artillery: Since Battery H appeared in the summaries as a light battery, we discussed this regiment’s service in detail in an earlier post. Colonel Joseph Roberts commanded. Ermentrout’s Battery: This militia battery, mustered during the Gettysburg Campaign, was mustered out at the end of August. 3rd Rhode Island Heavy Artillery: Battery C of this regiment appeared in the summaries, equipped as a light battery. The remainder of the regiment served as heavy artillery in support of the Department of the South (which has been chronicled at length on this blog….) Colonel Edwin Metcalf commanded the regiment. 5th Rhode Island Heavy Artillery: Colonel George W. Tew commanded this regiment, the serving the defenses of New Berne, District of North Carolina. 14th Rhode Island Heavy Artillery (African Descent): Organized on August 28, 1863, Colonel Nelson Viall commanded (some correspondence indicates a rank of Lieutenant-Colonel, as the regiment was only battalion strength at this time of the war). While forming, the regiment remained at Providence, Rhode Island. By the end of the year, one battalion would sail for Louisiana. 1st Tennessee Heavy Artillery (African Descent): Colonel Ignatz G. Kappner commanded this regiment, at the time more of battalion strength, garrisoning Fort Pickering in Memphis. The regiment later became the 3rd US Colored Troops Heavy Artillery. 2nd Tennessee Heavy Artillery (African Descent): This regiment, under Colonel Charles H. Adams, served at Columbus, Kentucky. The regiment would later be designated the 4th US Colored Troops Heavy Artillery. 1st Vermont Heavy Artillery: Colonel James M. Warner commanded this regiment, assigned to First Brigade, Defenses North of the Potomac, Twenty-second Corps. Batteries garrisoned Forts Totten, Massachusetts, Stevens, Slocum, and others. Company A, 1st Wisconsin Heavy Artillery: Captain Andrew J. Langworthy’s battery was assigned to the defenses of Alexandria, within DeRussy’s Division, Twenty-second Corps. Company B, 1st Wisconsin Heavy Artillery: Captain Walter S. Babcock’s company did not leave Wisconsin until September 1863. It was assigned duty at Murfreesboro, Tennessee. Company C, 1st Wisconsin Heavy Artillery: Still organizing in Wisconsin under Captain John R. Davies. This company moved to Chattanooga in October. 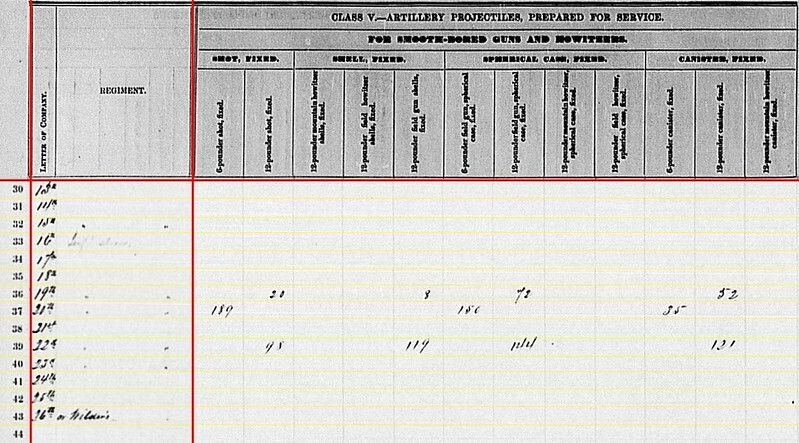 Company D, 1st Wisconsin Heavy Artillery: Would muster in November and then move to New Orleans. 1st US Colored Heavy Artillery: Would organize in February 1864 at Knoxville. 2nd US Colored Artillery: Light batteries organized starting in 1864. 3rd US Colored Heavy Artillery: See 1st Tennessee Heavy Artillery (African Descent). 4th US Colored Heavy Artillery: See 2nd Tennessee Heavy Artillery (African Descent). 5th US Colored Heavy Artillery: See 1st Mississippi Heavy Artillery (African Descent). 6th US Colored Heavy Artillery: Two units held this designation. The 2nd Mississippi Heavy Artillery (African Descent) and the 1st Alabama Siege/Heavy Artillery (African Descent). The former would retain the designation. 7th US Colored Heavy Artillery: The 1st Alabama Siege/Heavy Artillery (African Descent), assigned this designation after de-conflicting the duplication mentioned above. And to further confuse things, initially the 1st Louisiana Heavy Artillery (African Descent) was given this designation before using the 10th US Colored Heavy Artillery. 8th/11th US Colored Heavy Artillery: See 14th Rhode Island Heavy Artillery (African Descent), but would change to the 11th US Colored Heavy Artillery, as a new regiment with this designation was raised in Paducah, Kentucky, in April 1864. 10th US Colored Heavy Artillery: See 1st Louisiana Heavy Artillery (African Descent), formerly the 1st Corps de Afrique Heavy Artillery. Others: The 9th, 12th, and 13th US Colored Heavy Artillery were all new regiments formed in 1864. The 14th US Colored Heavy Artillery, also formed in 1864, began as the 1st North Carolina Heavy Artillery (African Descent). All to be detailed in later quarter summaries. In closing, please pardon the lengthy resource post. Much of this was derived from raw notes in my files. And as you can see, particularly with the USCT regiments, lead into interesting discussions about designation changes. On to the summaries for the fourth quarter of 1863! See you in 2019! Company K, 86th Ohio Infantry: Indicating “Artillery Stores” on hand at Cumberland Gap, Tennessee. The company reported one 6-pdr field gun, two 12-pdr mountain howitzers, one 12-pdr field howitzer, one 3-inch (steel or iron) rifle, and one 3.80-inch James rifle. I’ll discuss this company and regiment in more detail below. Company H, 71st Ohio Infantry: Again “artillery stores” on hand. In this case at Carthage, Tennessee. The 71st Ohio reported two 3-inch Ordnance Rifles. Let’s look at these in detail. First in the queue and perhaps the most interesting in regard to the background story is this less-well known regiment. First off, there were two 86th Ohios during the war. The first mustered in the June 1862 as a three month regiment. They mustered out in late September 1862. So not the 86th we are looking for here. The second 86th Ohio mustered (or re-organized, as some sources indicate) as a six-month regiment on July 17, 1863 at Camp Cleveland, Ohio. The muster was in response to Confederate activity, and akin to the militia and other emergency musters seen in other northern states. Colonel Wilson C. Lemert (formerly the major of the original 86th) commanded. The “hot issue” in Ohio at that time was Morgan’s Raid. So the 86th moved to Camp Tod, Columbus, Ohio, and operated in pursuit of the raiders. On August 11, the regiment moved to Camp Nelson, Kentucky. There, the regiment joined Colonel John De Courcy’s brigade which was moving on the Cumberland Gap. On September 9, the 86th deployed on the Harlen Road, leading into the north side of the gap, along with two guns from the 22nd Ohio Independent Battery, confronting one of the Confederate forts. Concurrently, other Federal troops deployed to cover approaches on both sides of the gap. This compelled the Confederates to surrender. A bloodless victory for Burnside. Most of these cannon and ordnance stores were repurposed by the Federals to help establish their garrison in the Cumberland Gap. And the 86th Ohio was part of that garrison. Matching Neil’s report with the summary, it seems one of the bronze 6-pdr field guns, the two 12-pdr mountain howitzers, and one James rifle were assigned to the 86th. Those are simple, easy matches. The summary indicates the 86th had a bronze 12-pdr field howitzer, but Neil indicates two iron 12-pdr field howitzer among those captured. So we have to consider if the clerks in Washington simply tallied an iron howitzer as bronze; if the 86th reported a bronze howitzer where in fact that was an iron howitzer; if Neil got the description wrong; or… if the 86th received a bronze howitzer from another source. Lastly, Neil did not mention any 3-inch rifles among the captured guns. Or for that matter any 3-inch ammunition. I suspect this came from another source (other than the captured lot). However, we might entertain the possibility that a Confederate 3-inch rifle was among those turned over to the 86th Ohio. Perhaps a slim possibility. Either from capture or reorganization, the 86th Ohio had six cannon by the end of September, 1863. These were commanded by Captain James W. Owens of Company K. The 86th Ohio remained at the Cumberland Gap through the middle of January 1864. At that time, they started a long seven day winter march out of the mountains and back to Ohio. They were mustered out on February 10, 1864. The cannon, however, were left up at the Cumberland Gap. In the words of one historian, this regiment had a checkered wartime service but in the end was “redeemed” in battle. Suffering from a bad reputation after Shiloh and having been captured in August 1862, the regiment was mostly assigned to garrison duties. In the summer of 1863, the regiment was assigned to First Brigade, Third Division, Reserve Corps, Army of the Cumberland. The regiment had duties protecting the Louisville & Nashville Railroad, with headquarters at Gallatin, Tennessee. Colonel Henry K. McConnell commanded. Carthage, Tennessee, was indeed one of the points garrisoned by the Third Division of the Reserve Corps. But there are no specific details I’ve found regarding details from the 71st assigned to that garrison. Though it was a concentration point for Tennessee unionists being formed into regiments. Furthermore, as Burnside reached Knoxville, Carthage, with its position on the Cumberland River, became an important connection between two armies then operating in Tennessee. We can confirm that two 3-inch Ordnance rifles were at Carthage, however. In a January 14, 1864 report on the artillery within the Department of the Cumberland, Major John Mendenhall commented that a lieutenant and thirteen men from the 13th Indiana Battery were at that post with the two rifles. So perhaps, for a short period during the summer and fall of 1863, the 71st Ohio had charge of those guns in Carthage. 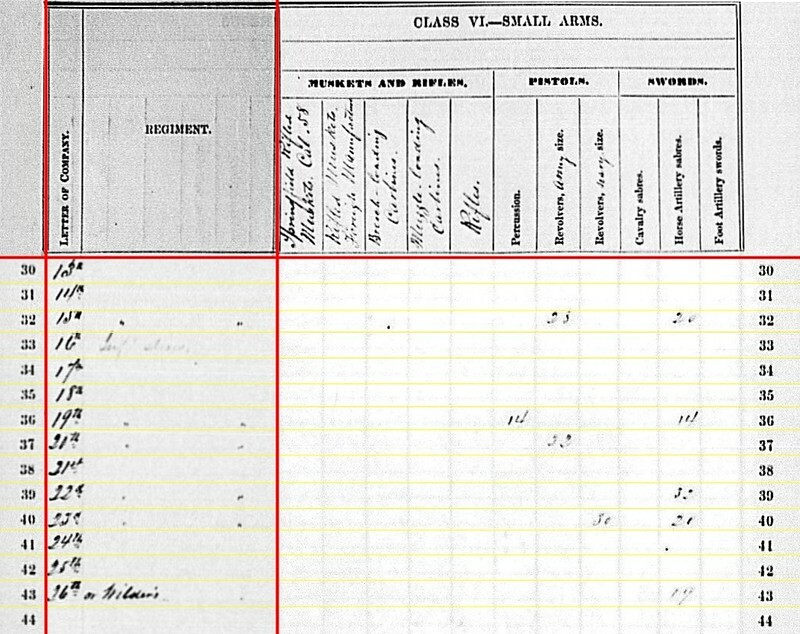 If I read the column correctly, and that assignment was to Company H, then Captain Elihu S. Williams of that company was responsible for the guns. 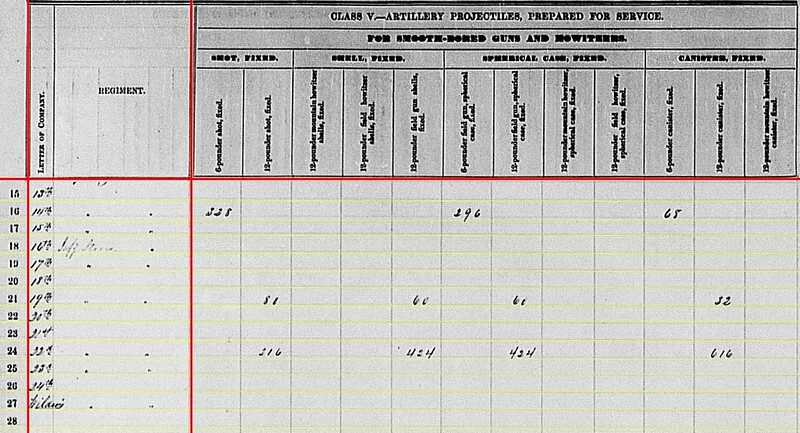 86th Ohio: 203 shot, 100 case, and 95 canister for 6-pdr field guns; 6 shot for 12-pdr field guns; 34 shell and 13 case for 12-pdr field howitzers; and 26 canister for either 12-pdr field howitzers or 12-pdr mountain howitzers. 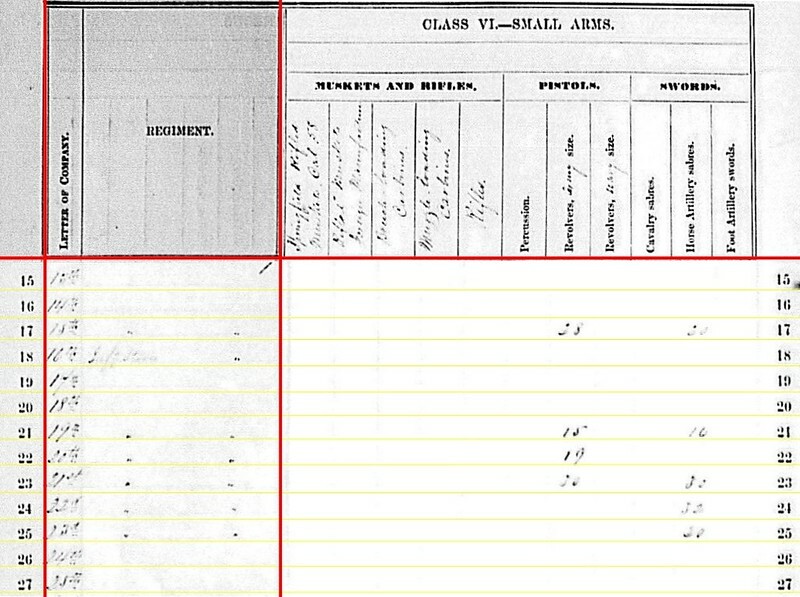 Referencing Neil’s report, it appears the 86th Ohio received only a portion of the overall ammunition stores. Perhaps only a portion issued for ready use, while the rest remained in centralized magazines? The presence of shot for 12-pdr field guns opens questions. 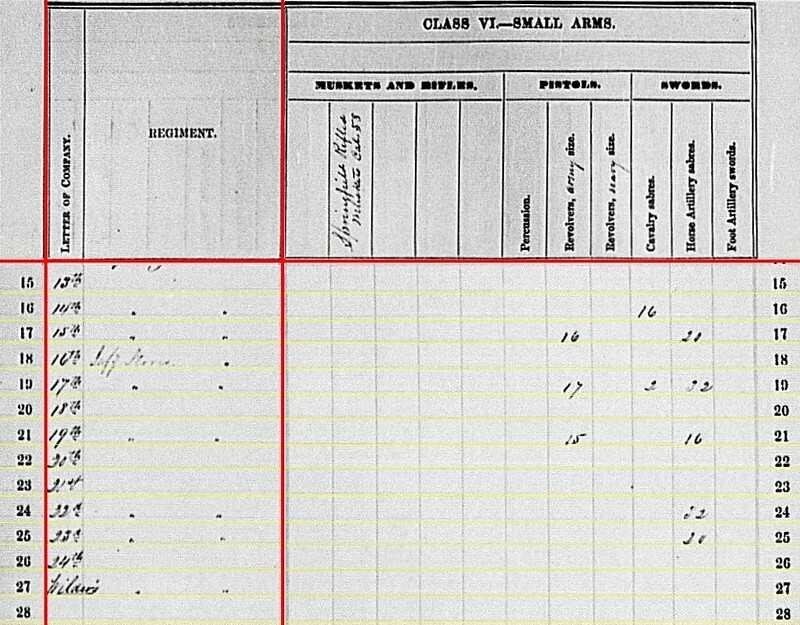 Neil reported the Confederates had, what would be non-standard, 12-pdr shot for their howitzers. So is this six 12-pdr shot for field guns? Or for howitzers? I could see either being the case. 71st Ohio Infantry: 43 canister, 9 percussion shell, and 290 fuse shell for 3-inch rifles. 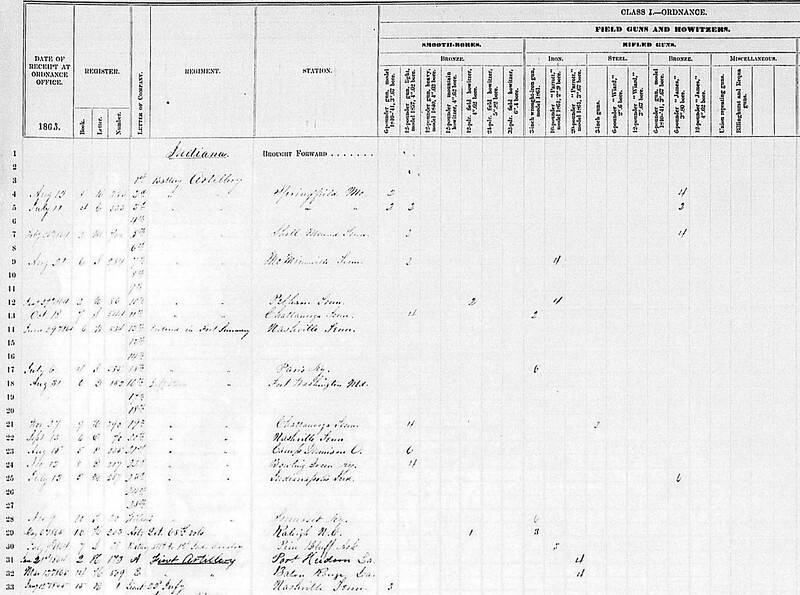 86th Ohio Infantry: 61 shot and 77 shell for 3.80-inch James. The questions here, with respect to what Neil reported, is if the shells are percussion shell and if these are “Federal” James projectiles being recaptured…. or Confederate copies. Neither infantry regiment reported Schenkl projectiles on hand. And they did not tally any small arms for these detachments. But I’ve posted those blank pages out of habit. Before leaving this discussion of Ohio’s non-artillery formations that happened to have cannon on hand, we have one other organization that is not listed on the summary. In mid-1863, returns from central Tennessee included an organization titled “Law’s Howitzer Battery” or simply “Mountain Howitzer Battery” under Lieutenant Jesse S. Law. I must not forget to mention the gallant conduct of Private Jesse Law, commanding the howitzer battery. This man well deserves a commission, and has been recommended for promotion. And indeed, Private Law was soon Lieutenant Law. And he remained in charge of four mountain howitzers. This battery supported Kautz’ brigade, First Division, Twenty-Third Corps, which was part of Burnside’s campaign in east Tennessee. Late in the campaign the battery remained intact, but serving separate from the 2nd Ohio Cavalry. With that, we can place the howitzers, and Law, somewhere around Knoxville at the close of the third quarter, 1863. However it appears by the end of the year Law’s howitzers were turned over to some other organization and the Lieutenant resumed cavalry duties. As for Law himself, I’ve got a lot of information about his career still being complied and organized. Not ready to post that just yet. I am fairly confident in saying he was an artilleryvman before the war with Battery G, 4th US. And he was discharged just after the battle of Antietam. From there, he enlisted in the 2nd Ohio Cavalry and later received the promotion mentioned above. Unfortunately, Law didn’t retain those lieutenant bars long. Law was dismissed from the service in December 1864. The details of that part of the story I am still working on. 13th Battery: No return. Captain Benjamin S. Nicklin’s battery remained at Gallatin, Tennessee, garrisoning Fort Thomas, in the Army of the Cumberland. 14th Battery: No return. Lieutenant Francis W. Morse remained in command. The battery started the summer in Jackson, Tennessee. In June, the battery transferred to the railroad town of LaGrange and remained there for the remainder of the summer. Presumably still with three 6-pdr field guns and one 3-inch Ordnance Rifle, the battery was part of the Sixteenth Corps’ many garrison commands. 15th Battery: At Oak Springs, Tennessee with six 3-inch rifles. Captain John C. H. von Sehlen commanded this battery, assigned to Fourth Division, Twenty-Third Corps and part of the campaign moving on Knoxville. The report location is likely related to the November reporting date. 16th Battery: A return of Fort Washington, Maryland without any guns listed. There is a faint note “Infy Stores” under the regiment column. Lieutenant Charles R. Deming’s battery were part of the Washington Defenses. 17th Battery: No return. At the end of the Gettysburg Campaign, Captain Milton L. Miner’s battery became part of the Maryland Heights Division, Department of West Virginia. The battery reported six 3-inch Ordnance Rifles in previous quarters. 18th Battery: No Return. Captain Eli Lilly’s battery supported Wilder’s Brigade, Fourth Division, Fourteenth Corps. The battery brought six 3-inch rifles and four 12-pdr mountain howitzers to Chickamauga. The mountain howitzers supported the 72nd Indiana on September 20, and one of those was lost in the fighting. Lilly reported the lost of two men killed and eight wounded; six horses (plus one wounded); and expending 778 rounds. A shame we don’t have a return from this… unique… and storied battery. 19th Battery: Reporting at Chattanooga, Tennessee with three 12-pdr Napoleons and one 3-inch Rifles (not under the usual Ordnance Rifle column). This was a return dated January 1864. But the location is valid. Captain Samuel J. Harris’s battery was also part of Fourth Division, Fourteenth Corps and went into action at Chickamuaga with four 12-pdr Napoleons and two 3-inch Ordnance Rifles. On September 19, Harris was “disabled by a contusion” to his right side and turned command over to Lieutenant Robert S. Lackey. During the fighting that disabled Harris, the battery lost a Napoleon and limber. On the 20th, Lackey kept the battery in the fight, but would have one surviving Napoleon (axle straps) and a 3-inch rifle disabled. While the Napoleon was brought off the field, the rifle’s axle came completely off and was had to be left behind. Harris provided a very detailed statement of lost men, equipment and material after the battle. In addition to the guns, the battery suffered two killed, 16 wounded, and two missing men. The battery had fifteen horses lost or killed and six wounded. Harris accounted for four lost pistols, three sabers, seven sponges, four sponge buckets, two prolongs, among other items. The battery expended 350 3-inch rifle rounds and 750 12-pdr in the battle. Harris recovered and remained in command of the battery. 20th Battery: At Nashville, Tennessee with two 6-pdr field guns and four 3.80-inch James rifles. Captain Milton A. Osborne’s battery was assigned to the artillery reserve posted to Nashville, under the Army of the Cumberland. In October, the battery was among the forces pushed out to secure the railroad lines out of Nashville. 21st Battery: No return. Captain William W. Andrew’s battery was the third Indiana battery assigned to Fourth Division, Fourteenth Corps. However, Lieutenant William E. Chess field the battery’s report from the battle and appears to have lead the battery in the action. They took six 12-pdr Napoleons into action, but lost one (and limber). Chess recorded firing 10 shot, 168 case, 104 shell, and 160 canister – giving us some indication of the range at which this battery was engaged, and what targets they fired upon, during their part of the battle. 22nd Battery: At Bowling Green, Kentucky with four 12-pdr Napoleons. Under Captain Benjamin F. Denning, this battery was assigned to the Second Division, Twenty-Third Corps, Army of the Ohio. Through the fall, the battery served at both Bowling Green and Russellsville, Department of Southwestern Kentucky. 23rd Battery: Reporting at Jonesboro (? ), Tennessee with six 3.80-inch James Rifles. Captain James H. Myers’ battery came across the Ohio River in September and was assigned to the “Left Wing” of Twenty-Third Corps. Moving by way of the Cumberland Gap, the battery was among the forces operating around Morristown at the start of October. 24th Battery: No return. Under Captain Joseph A. Sims, this battery moved from the Third Division to the Fourth Division in Twenty-Third Corps in August. Though that move was basically part of the alignment of forces for the campaign on Knoxville. 25th Battery: No return. The 25th would not organize until the late summer of 1864. So this is simply a placeholder line. 26th Battery or Wilder’s: At Concord, Tennessee (just west of Knoxville) with six 3-inch Ordnance Rifles, with a report date of March, 1864. Recall this battery was first organized by (then) Captain John T. Wilder, later colonel of the famous “Lightning Brigade.” The battery was captured at Harpers Ferry in 1862 and then reorganized. Though given the 26th as a designation, throughout its service the battery was better known as Wilder’s. Captain Hubbard T. Thomas commanded the battery, assigned to the Twenty-Third Corps. The battery participated in the Knoxville Campaign in East Tennessee. The location given in the return, however, likely reflects its winter garrison assignment. As with the first batch of batteries, we see the “mark” of Chickamauga here reflected with lost cannon and in some cases missing reports. 19th Battery: 20 shot, 8 shell, 72 case, and 52 canister for 12-pdr Napoleons. 20th Battery: 189 shot, 150 case, and 35 canister for 6-pdr field guns. 22nd Battery: 98 shot, 119 shell, 144 case, and 121 canister for 12-pdr Napoleons. Note, the 19th Battery had but 152 rounds for their three Napoleons in the aftermath of Chickamauga. That is if we take the report as precise for the moment in time. 15th Battery: 460 canister, 402 fuse shell, and 1246 bullet shell for 3-inch rifles. 20th Battery: 145 percussion shell and 392 bullet shell for 3.80-inch James. 23rd Battery: 365 percussion shell, 315 fuse shell, and 95 bullet shell for 3.80-inch James. 26th Battery (Wilder’s): 520 canister, 260 percussion shell, 574 fuse shell, and 426 bullet shell for 3-inch rifles. So we see those batteries sent into eastern Tennessee had ample ammunition on hand. 20th Battery: 150 canister for 3.80-inch rifles. 23rd Battery: 210 canister for 3.80-inch rifles. 15th Battery: Twenty-eight Army revolvers and twenty horse artillery sabers. 19th Battery: Fourteen percussion pistols and fourteen horse artillery sabers. I think the pistols are a transcription error, as the battery reported nineteen Army revolvers in the previous quarter. 20th Battery: Twenty-two Army revolvers. 22nd Battery: Thirty-two horse artillery sabers. 23rd Battery: Thirty Navy revolvers and twenty horse artillery sabers. 26th Battery (Wilder’s): Nineteen horse artillery sabers. Moving from the independent batteries from Indiana for this quarter, we still have five entries “below the line” to consider. We’ll pick those up in the next installment. 13th Battery: No return. Captain Benjamin S. Nicklin’s battery remained at Gallatin, Tennessee. Though part of the Army of the Cumberland, the battery was unattached. 14th Battery: No return. This battery remained part of the District of Jackson, Sixteenth Corps, presumably still with three 6-pdr field guns and one 3-inch Ordnance Rifle. Lieutenant Francis W. Morse remained in command. 15th Battery: Reporting at Paris, Kentucky with six 3-inch rifles. After assignment to the Fourth Division, Twenty-Third Corps, the battery was part of the Federal response to Morgan’s July 1863 Raid. Captain John C. H. von Sehlen commanded. 17th Battery: No return. Captain M. L. Miner’s battery was part of French’s Division, Eighth Corps. During the pursuit phase of the Gettysburg Campaign, the battery would return to Maryland Heights at Harpers Ferry, with their six 3-inch Ordnance Rifles. 18th Battery: No Return. Captain Eli Lilly’s battery remained with the Fourth Division, Fourteenth Corps, and thus involved with the Tullahoma Campaign at the end of the reporting period. 19th Battery: Reporting at Chattanooga, Tennessee with four 12-pdr Napoleons and two 3-inch Rifles (not under the usual Ordnance Rifle column). Like the 18th, Captain Samuel J. Harris’s battery was part of Fourth Division, Fourteenth Corps. Thus the location of Chattanooga reflected a later reporting date. 20th Battery: At Nashville, Tennessee with no weapons reported. Captain Milton A. Osborne’s battery was assigned to the artillery reserve posted to Nashville, under the Army of the Cumberland. 21st Battery: At Camp Dennison, Ohio with six 12-pdr Napoleons. The location offered is clearly an error. Captain William W. Andrew’s battery was the third Indiana battery assigned to Fourth Division, Fourteenth Corps. And thus were on the move through middle Tennessee at the time. 22nd Battery: At Bowling Green, Kentucky with four 12-pdr Napoleons. Under Captain Benjamin F. Denning, this battery was assigned to the Second Division, Twenty-Third Corps, Army of the Ohio. 23rd Battery: Reporting at Indianapolis, Indiana with six 3.80-inch James Rifles. Captain James H. Myers’ battery remained in the District of Indiana and Michigan, charged with guarding prisoners. Later in the summer the battery would get the call to the field. 24th Battery: No return. Under Captain Joseph A. Sims, this battery was newly assigned to the Third Division, Twenty-Third Corps, with duty in Kentucky. The battery was among those mobilized to chase Morgan in July. 25th Battery: No return. This is a curious entry line. The 25th would not organize for another year. So at best this is simply a placeholder. As I said earlier, very few changes from the previous quarter. 19th Battery: 20 shot, 15 shell, 12 case, and 72 canister for 12-pdr Napoleons. 21st Battery: 463 shot, 126 shell, 491 case, and 161 canister for 12-pdr Napoleons. 22nd Battery: 131 shot, 141 shell, 144 case, and 155 canister for 12-pdr Napoleons. 23rd Battery: 930 canister for 6-pdr field guns. So there we have the 23rd Battery, guarding prisoners in Indianapolis, with James rifles loaded up with 6-pdr canister. Well, it would fit into a 3.80-inch bore! 15th Battery: 340 canister, 342 fuse shell, and 1,207 (?) bullet shell for 3-inch rifles. 19th Battery: 76 canister, 68 percussion shell, 55 fuse shell, and 40 bullet shell for 3-inch rifles. 23rd Battery: 390 percussion shell and 330 fuse shells for 3.80-inch rifles. 19th Battery: 17 shell for 3-inch rifles. 23rd Battery: 95 case shot for 3.80-inch rifles. 15th Battery: Twenty-eight Army revolvers and twenty (?) horse artillery sabers. 19th Battery: Fifteen Army revolvers and sixteen horse artillery sabers. 20th Battery: Nineteen Army revolvers. 21st Battery: Thirty Army revolvers and thirty horse artillery sabers. 23rd Battery: Twenty horse artillery sabers. Uniformity… somewhat. And with that we can close the Indiana independent batteries. Or can we? Yes, there are six “others” at the bottom of the section. One of which would become the 26th Indiana Independent Battery later in the war. We’ll look at them in the next installment. 13th Battery: No return. Captain Benjamin S. Nicklin’s battery began the year posted to Gallatin, Tennessee. Though part of the Army of the Cumberland, the battery was unattached. 14th Battery: At Jackson, Tennessee with three 6-pdr field guns and one 3-inch Ordnance Rifle. With the new year, Lieutenant Homer H. Stull commanded the battery. Shortly into January, Lieutenant Francis W. Morse was listed as commander. The battery came under the Sixteenth Corps with Grant’s reorganizations, but remained at Jackson. 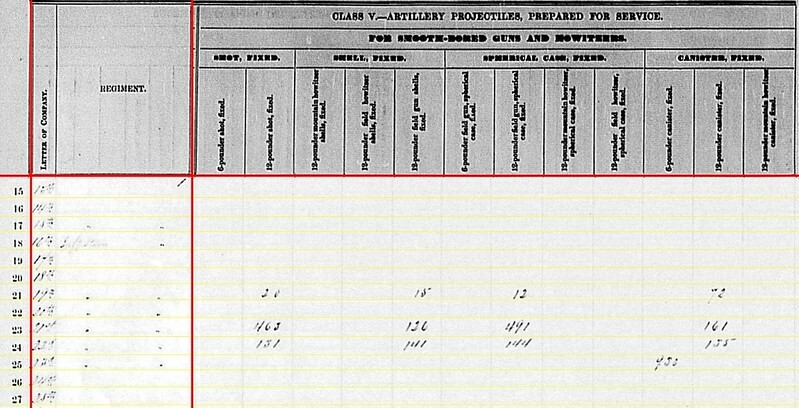 15th Battery: This battery was in Paris… Kentucky that is … with six 3-inch rifles, according to the summary. That would be valid for later in the year. But in March 1863 it was under Captain John C. H. von Sehlen and in transit through Indianapolis. The battery was part of Burnside’s command being transferred west. 16th Battery: A return of Fort Washington, Maryland without any guns listed. There is a faint note “Baty Stores” under the regiment column. Lieutenant Charles R. Deming’s battery were part of the Washington Defenses. 17th Battery: At Harpers Ferry, West Virginia with six 3-inch Ordnance Rifles. Captain M. L. Miner’s battery supported the Maryland Brigade in the Eighth Corps. 18th Battery: No Return. Captain Eli Lilly’s battery was part of the reorganized Fourteenth Corps in the winter of 1863, posted in the sprawling Fortress Rosecrans at Murfreesboro. 19th Battery: Also at Murfreesboro, and filing a return showing four 12-pdr Napoleons and two 3-inch Ordnance Rifles. And like the 18th, Captain Samuel J. Harris’s battery was part of Fourteenth Corps. 20th Battery: No return. Captain Milton A. Osborne’s battery was assigned to the District of Western Kentucky. According to an inventory posted later in June, the battery had four 12-pdr “heavy” field guns. 21st Battery: No return. Serving through the winter with the Army of Kentucky, Captain William W. Anderw’s battery transferred to the Fourteenth Corps later in June. 22nd Battery: At Louisville, Kentucky with four 12-pdr Napoleons. Under Captain Benjamin F. Denning, this battery was mustered into service in December 1862. They were placed in the Twenty-Third Corps, Army of the Ohio later in the spring. 23rd Battery: Reporting at Indianapolis, Indiana with six 3.80-inch James Rifles. Captain James H. Myers’ men were charged with guarding prisoners during the winter of 1863. 24th Battery: No return. Under Captain Joseph A. Sims, the battery was just leaving the state in March 1863. They would become part of the Twenty-Third Corps. Wilder’s Battery (26th Battery): Reporting at Knoxville, Tennessee with six 3-inch Ordnance Rifles. However, that location is probably reflective of the reporting date of August 20, 1864. The battery was among those surrendered at Harpers Ferry the previous campaign season. Going through the formalities of parole, the battery was actually posted at locations in Illinois and Indiana during the winter. Lieutenant Caspar W. McLaughlin was in command. We’ll find the battery assigned to the Twenty-Third Corps later in the spring. Notice that Wilder’s Independent Battery later received, at least on some records, the numerical designation of the 26th Battery. The 25th Battery would not muster in until November 1864. 14th Battery: 328 shot, 296 case, and 68 canister for 6-pdr field guns. 19th Battery: 80 shot, 60 shell, 60 case, and 32 canister for 12-pdr Napoleons. 22nd Battery: 216 shot, 424 shell, 424 case, and 616 canister for 12-pdr Napoleons. Hey, now! The 22nd Battery was trying to defy the inference I made last week! But keep in mind that battery was just coming into service in March 1863. And by the reporting date of November 1863 (since we’ve seen that weigh on the data clerks transcribed) the battery had served as garrison artillery for several months. Such may explain the ammunition mix. 14th Battery: 45 canister and 162 percussion shell in 3-inch caliber. 15th Battery: 360 canister, 360 fuse shell, and 1080 bullet shell for 3-inch rifles. 17th Battery: 250 canister, 212 fuse shell, and 719 bullet shell for 3-inch rifles. 19th Battery: 76 canister, 86 fuse shell, and 98 bullet shell for 3-inch. 23rd Battery: 440 percussion shell and 355 fuse shell for 3.80-inch James. 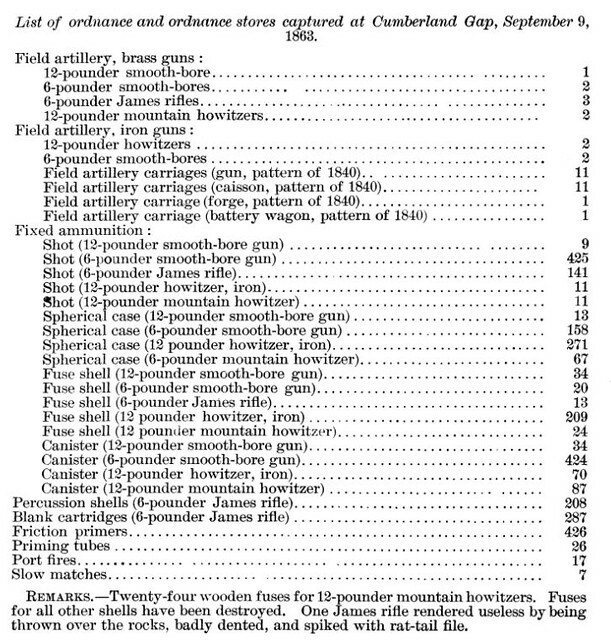 Wilder’s Battery: 600 canister, 180 percussion shell, 362 fuse shell, and 456 bullet shell for 3-inch rifles. Again, we see rather large quantities of canister. But those batteries reporting also happened to be assigned rear area duties. So we don’t necessarily have an example of a trend being bucked. Even the 19th Battery, assigned to a field command, was placed in a fortification at the reporting period. I’d call more attention to the 23rd Battery, which was guarding prisoners, with no canister on hand. Guess just having a big bore James rifle on hand was scary enough. That is for 23rd Battery, reporting 95 James-pattern 3.80-inch case on hand. 14th Battery had 83 Schenkl 3-inch shells on hand. 14th Battery: Sixteen cavalry sabers. 15th Battery: Sixteen Army revolvers and twenty horse artillery sabers. 17th Battery: Seventeen Army revolvers, two cavalry sabers, and thirty-two horse artillery sabers. 19th Battery: Twenty-five army revolvers and sixteen horse artillery sabers. Not a lot of excess small arms for these batteries. In particular, these Indiana artillerists didn’t have many firearms on hand. Perhaps that’s the way their commanders preferred. So they could focus on their larger, crew-served weapons.